Richie Foran grabbed the winner as Motherwell edged the Lanarkshire derby against Airdrie United to move into the fourth round of the Scottish Cup. A Danny Murphy cross was cleared off the Airdrie line before fellow new signing from Irish football Trevor Molloy set up Foran to head home. A Stephen McKenna effort struck the Motherwell crossbar. And, although Airdrie ended the game with four strikers and with much pressure, they exited the cup. 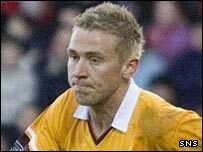 New signings Murphy and Molloy had started for Motherwell in place of the injured Jim Paterson and suspended Marc Fitzpatrick. Garry Tierney replaced Paul Lovering in an Airdrie defence that was quickly under pressure. Foran went close with a left-footed drive from the edge of the box. The hosts looked menacing when Steven McDougall skipped past two players and fed Gary Twigg in the box, but his dangerous cross was cleared. A Murphy cross had already been cleared off the line by Tierney before the visitors took a deserved lead on the half-hour mark. Foran bulleted a header home from close range after Molloy swung in a cross from the left side of the box. Airdrie almost equalised after 36 minutes, when McKenna rattled the crossbar with a 25-yard effort. And goalkeeper Graeme Smith was called on to make a fine save from Stephen McKeown following a free-kick on the stroke of half-time. It was untidy after the break as the game descended into a dour midfield battle until an exciting finale. McKeown fired over the Motherwell bar from 30 yards. And Twigg scuffed another effort from 22 yards as Airdrie found it difficult to get in behind a Motherwell side seemingly intent on simply protecting their lead. But the introduction of substitute Aime Koudou threatened the change the match as he jinked into the Motherwell penalty box and caused panic in the box when the ball was spilled by the goalkeeper before being thumped clear. McDonald fired wide at the other end from the edge of the box after a quick breakaway. And Smith pushed efforts from McKeown and McKenna wide as Airdrie exerted late pressure without making a deserved breakthrough. Airdrie Utd: Robertson, Smyth, Tierney (Koudou 76), McGowan, McKenna, McDougall (McPhee 86), Taylor, McKeown, Holmes, Barrau (Prunty 79), Twigg. Subs Not Used: Hollis, Watson. Motherwell: Graeme Smith, Corrigan, Craigan, Reynolds, Murphy, Molloy (Darren Lee Smith 60), Kerr, McGarry, Foran, McDonald (Connolly 90), Clarkson. Subs Not Used: Meldrum, Keegan, Quinn. Booked: Murphy, Darren Lee Smith.